Send this Flashy Weakness Blossom Ensemble as a season-special symbol of your greetings to the most valued person of your life and let music of merriment ring within the individual’s mind. 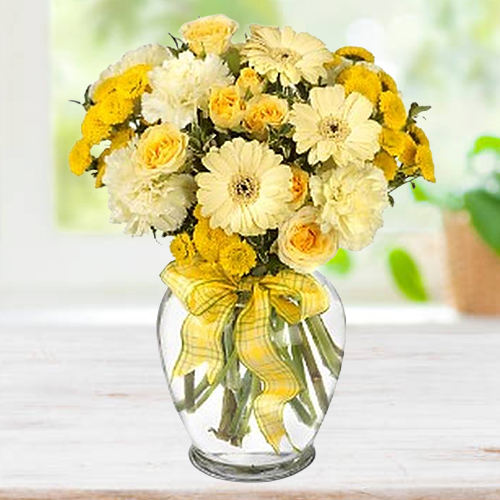 This is a titillating Ensemble of shimmering and striking 10 Yellow Roses, 5 White Carnations and 5 White Gerberas. Flowers Delivery Aligarh, Send sweets Mysore, Wedding Cake Goa, Diwali Mithai Calcutta, Send Flowers and Gifts to Vellore, Online Shop Modinagar, Flower to Baramati, New Year Flowers Allahabad , Fresh Fruits Panaji, Send Gift Anand, Dry Fruits to Bikaner, Birthday Delivery Bhusawal, Sending to Jamnagar, Flower shop Manipal, Barrackpore Online Cake Delivery.